Basically, the point here is that some parts of a village are very fluid, so they should be regarded as "experiments". Other parts are quite static, so we can design them to pretty much be, what we want them to be. And finally, some things are just so random and wild, that we should only design to cope with them, and not for specific results. The purpose of such a design, is to define, in advanced, what we want built-into the village. It is very hard to decide on how we want our village to be, when we are not even sure what is relevant for the design process. 1. 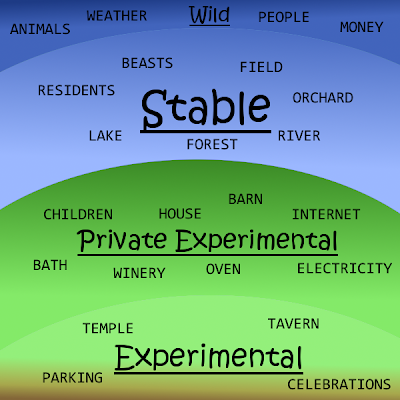 Limitations on private experimentation, so that we get people who are either more or less adventurous. 2. Limitations on public experimentations, so that we get people who are either more or less social. 3. Limitations on shared resources, so that we get people who enjoy a life style similar to our own taste. The focus is the village's intended population and the village's intended functionality. Naturally, this is all in regard to Permaculture ideals, so it will not answer the wishes of many, who do not take interest in bold new ways! For example, could we design a vegan village? A vegan diet (or life style) denies two things: animal produce and the preparation of animal produce. Animals, as in husbandry, generally require access to the Stable section of the village, for grazing and happiness. The preparation of animal produce, generally requires in-house equipment and storage, which is under the Private Experimental section. It is unlikely to be able to design any denying mechanism in the Private Experimental section, because a person's home is "their fortress." That is fair enough. On the other hand, for serious meat eating, beasts need proper grazing. If we design the Stable section, which includes all the shared land around and between the houses, so that it is inhospitable to beasts, then we can design the village to be utterly offensive to meat farmers. That would be enough to disgust a prospective buyer that has any ideas about growing beasts for their products. 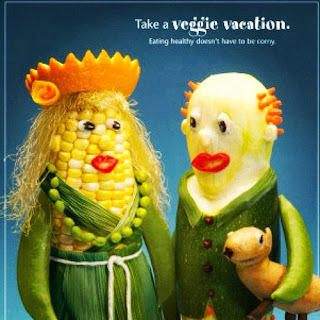 A vegan vacation! It's vegelicious! In this very penetrating case, we come to the conclusion that while no one can be forced to be a vegan, in their privacy, by design; it is still possible to design a village, so it discourages meat farmers and meat eaters, away.